Roughly 350 Loudoun teenagers returned to school Thursday with a little more of an idea of what life could look like after graduation. The high school students spent Wednesday scattered throughout Loudoun County shadowing people in a variety of professions as part of the annual Job-for-a-Day program. The Loudoun School-Business Partnership-sponsored event invited students to get a glimpse of a career they are considering pursuing. Students’ one-day internships ranged from Ford’s Fish Shack, to see the inner workings of a mom-and-pop restaurant operation, to Howard Hughes Medical Institute’s Janelia Research Campus, to get a glimpse of a day in the life of a scientist. Fifty-four students landed Job for a Day spots at Inova Loudoun Hospital, the largest employer to take part in the Job for a Day program. The slots filled up quickly, according to Stacey Miller, the hospital’s government and community relations liaison. “It’s like trying to get concert tickets,” said Miller, also a member of the Loudoun School-Business Partnership Executive Council. 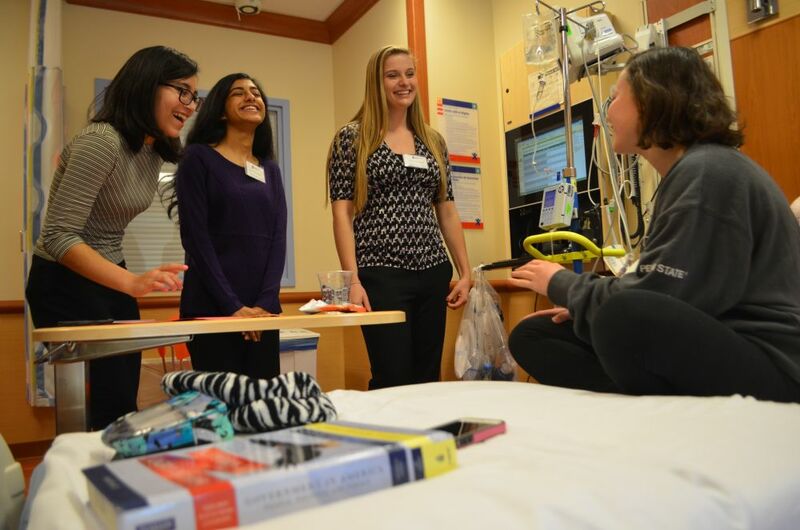 Juniors Jasmine Malik, of John Champe High School, and Alondra Deleon Robles, of Riverside High School, got a glimpse of the business side of the hospital. Jasmine shadowed Reneé Brohard, who oversees public relations for Inova Loudoun Hospital. She said she’s always been interested in either a career in medicine or business. “This gave me a good look at a job that combines the two, which I really liked,” she said. Alondra, who shadowed Miller, got to tag along to a Loudoun County Chamber of Commerce meeting. She said she loved getting to meet community nonprofit and business leaders. “It was really, really cool,” she said. Stone Bridge High School senior Grace Boyles spent Wednesday shadowing nurses in the pediatric ward. She’s considered pursuing a career as a nurse, but had a few reservations, until yesterday. “This was such a good experience. It totally solidified my decision,” she said. 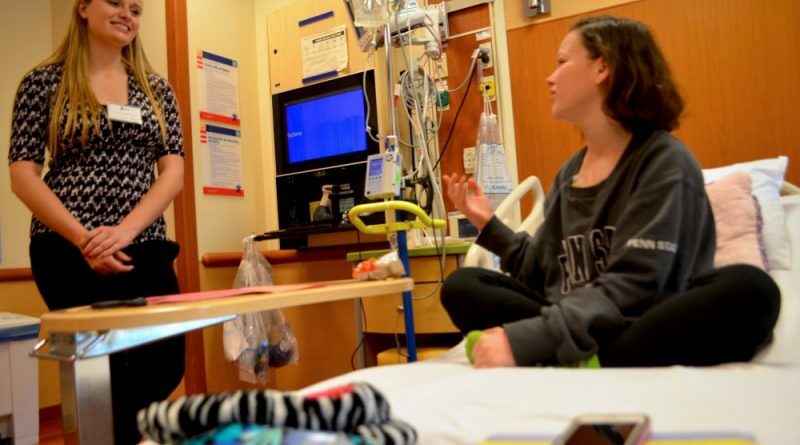 She helped a nurse give 18-year-old patient Shannon Lyons an IV infusion of prednisone. Lyons has dermatomyositis, a rare connective-tissue disease that is characterized by inflammation of the muscles and the skin. She is one of five people within 25 miles of her home in Centreville to have the disease. After learning about the Job for a Day program offered to Loudoun students, Lyons, a student at Centreville High School, said she wants to see something similar in Fairfax County. “It’s hard to know what you want to do as a career without really experiencing it,” she said. She would love to work as a pediatric nurse and help young patients, just like her nurses have helped her. In all, 126 businesses and organizations hosted students. Miller said the Loudoun School-Business Partnership Executive Council is always looking for more Job for a Day host sites. Learn more about Job for a Day at loudoun.k12.va.us/Domain/86.